This fine country house was built by Philip Antrobus and passed on to Samuel Greg. It was once called Gregs Hall in the1951 census. 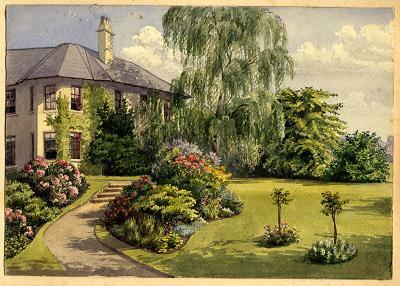 During the 19thC the house seems to have been known simply as Mount. 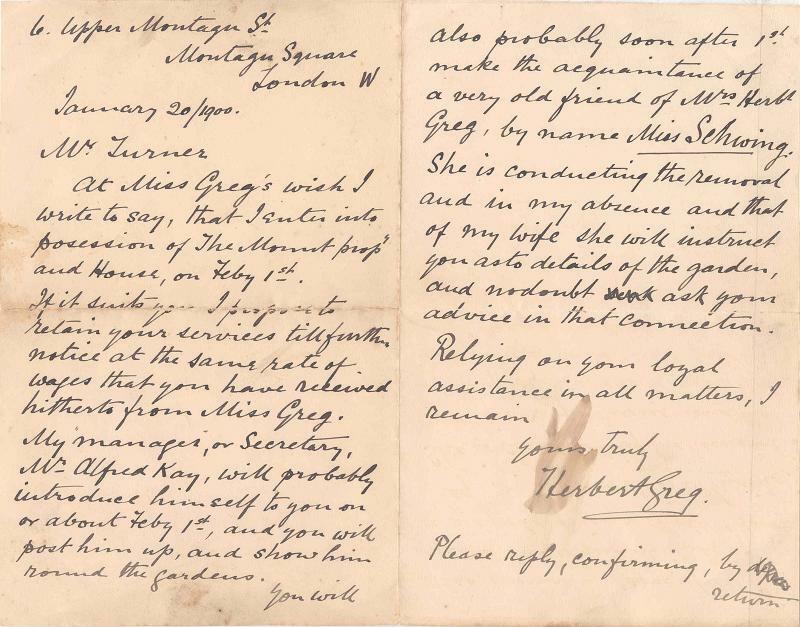 I am not sure when it became The Mount although that is the name given by Herbert Greg in a letter (below) written on 20th January 1900 just as he was inheriting the estate from his niece Amy Greg. ‘Mr Turner’ was Mr Isaac Turner, head gardener. His grand-daughter, the late Mary Houghton, lived in Bollington Cross, and I am indebted to her for providing the letter. 1841: Thomas Henshall lived at The Mount with his wife Ann, they were both aged forty years and Thomas was a farmer. 1861: The census says Samuel Greg was living here aged fifty nine, originally from Wilmslow Samuel is described as a Magistrate and land proprietor. His wife Mary aged fifty one was from Nottingham. They had three daughters and one son age range ten to eighteen years, they were all born in Bollington. They had two servants. Ten years earlier the family lived at Gregs Place, Bench Lane (Flash Lane) so this is probably the Mount. Twenty nine years previously they lived at Heath Farm which would be Turner Heath with a one year old child. 1961: Agnes Greg is underneath Samuel Greg`s listing on the census as living at Mount house which is the same title as Samuels house. She is sixty four years old and described as a `Shareholder`. 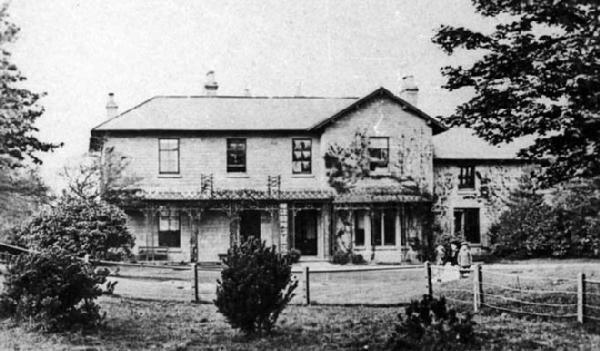 She lived with three servants and had two visitors on this day including her brother John Greg. 1871: Samuel Greg is now sixty six (he has lost three years! ).He is still a Magistrate and a landowner. His wife has remained honest with her age and is sixty one years old! Two daughters and a son still live with them,age range twenty to thirty one. The youngest, the son, is Clerk to a solicitor at this time. 1871: Again Agnes Greg follows on down the page on the census with the same name house. She now has seven servants and one visitor this day. 1881: Same page again is Mary Greg now a widow, and her family and servants. 1891: Mary Greg, wife of Samuel was still living at the Mount. She is now eighty one years old. She lives with her three spinster daughter aged between forty one and fifty one and four servants. Plus two Daughter`s in Law, Gertrude Greg and Alice Dowson and a grandson Gerard Dowson aged sixteen. 1892: Kelly`s Directory just lists a Miss Greg living at the Mount. Not sure which daughter this was of the three, or possibly the Daughter in Law Gertrude. 1896: Kelly`s Directory has Herbert Greg as registered here. 1911: Bolton born Gertrude Greg is now head of the Mount aged forty five years. Listed as married but her husband is not home on this day.She has one son Osbery aged nineteen years also born in Bolton, five servants and one visitor. In 1926 Mrs Victoria Hammond live at the Mount. In the 1930s and 40`s. The Mount was occupied by Miles Kenneth Burrows born 1888, Deputy Chairman, Managing Director and Secretary of Manchester Collieries Limited in 1947, and his wife Margaret born 1889. He was also President of the Lancashire & Cheshire Coal Association. Also living at the Mount was Walter Burrows born 1886, listed in the 1939 census as a Regional Director Staff. 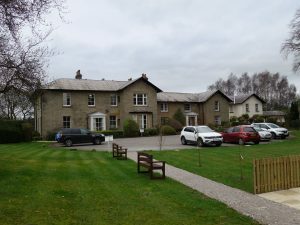 Another member of the family, Sir Robert Burrows, lived nearby at Bonis Hall. We are trying to trace members of the Burrows family. Today The Mount is a retirement care home. In the years from 2003 Pam & Tony Lawton have worked very hard to restore various parts of the garden to the way they were before nature and a lack of care produced an overgrowth of foliage, and they have opened up many of the features of this delightful garden.